BEVERLY HILLS, Calif. – A coin collector paid a record $8.5 million for a set of rare coins said to have been a gift from former President Andrew Jackson to the King of Siam. Steven L. Contursi, president of Rare Coin Wholesalers, bought the set of 19th century gold, silver and copper coins from an anonymous owner described only as “a West Coast business executive,” according to Donn Pearlman, the buyer’s publicist. The coins were last purchased for more than $4 million in 2001. At face value, they range from a copper half cent to a $10 gold piece, Pearlman said. A collectibles firm brokered the purchase Tuesday. In 1836, then President Andrew Jackson presented the King Ph’ra Nang Klao (Rama III) of Siam, now Thailand, with the diplomatic gift. The Broadway musical “The King and I” fictionalized the king’s son, Rama IV, who inherited the coins. 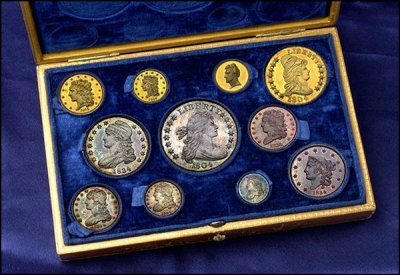 The set includes a U.S. silver dollar marked 1804 and known as the “king of coins,” Contursi said. One of only eight known “Class I” U.S. silver dollars, the coin could fetch more than $6 million if sold as a single item, he said. “This set is a national treasure. It opened trade routes for our young nation to the Far East. So it’s more than just coins, it’s U.S. history,” Contursi said.